I had an extremely strange couple of days, so instead of talking about that I thought I would tackle the third talkback challenge. For this one my good friend Jaedia posted a prompt on the Newbie Blogger Initiative website asking “What Made You A Gamer?”. This is one of those topics that I have thought long about for years, and I am not really sure what the answer is. I am not sure if there is any one thing that makes someone a gamer. I think you are either born with the natural proclivities in that direction or you are not. My earliest memories of gaming are pretty clear however. 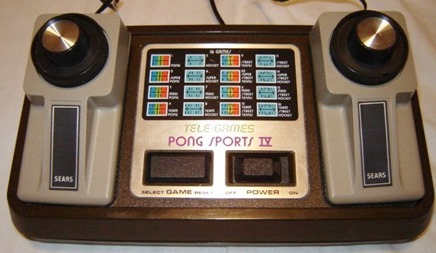 My parents had a Sears and Roebuck version of the Atari Tele-Games console system… aka Pong. I remember being completely enamored with being able to move the bar on screen to intercept the square bouncing around the screen. I don’t necessarily remember playing this all that often because well… it was my parents toy and not mine, but I remember the desire being real. A few years later thought my parents purchased an Atari 2600, and that is the system I remember being “mine”. My mom was a teacher and I guess one of her students was selling theirs used. This is important because it sets up a long tradition of me buying console systems second hand that I continue today with my Craigslist finds. The console came with the base system, several well worn controllers and a dozen or so games for the big price of $50… which actually was quite a bit of money back then. I was enthralled by the games and while they really had no story to tell on their own, it didn’t stop me from making up stories. Even the most generic game could be a vehicle for me to tell tales of valor and bravery. I remember for whatever reason that Sea Quest was one of my favorite games at the time, which was this simple game about going down in a sub marine to save divers. In my head I was this crack submarine pilot fighting off sharks to rescue my troops. At this point we are going to take a bit of a detour, because I was happily an Atari kid for years making up stories to fill in the gaps that the games were not providing for me. Then an event happened that literally changed my trajectory permanently. As I have said before I grew up the child of a teacher, and that means a bunch of things. Not the least of which is that you end up spending a lot of time up at school waiting for your teacher parent to “wrap things up”. I knew all of the janitorial staff by name and they were a kind of family that I hung out with as they did their things, and I waited on my mother. At the end of the school year there was a tradition, the great locker cleanout. On the last day of school, anything that was left in the student lockers at 4 pm was going to get dumped in the ground and thrown out, to clear the lockers to be cleaned for the next school year. I learned my scavenging instincts at a young age, and this was pretty much a magical time for me as I wandered around through the piles of debris picking up gems. Most of the treasures I found were in the realm of nifty “stationary” items like binders or notebooks, but I remember during second grade I stumbled upon a book that quite literally changed my life from that point onwards. That seems like a fairly bold statement but finding a dusty well worn copy of Advanced Dungeons and Dragons Players Handbook was like opening a whole other world to me. To say I was obsessed with this was a bit of an understatement. I poured over the pages of the tome soaking in everything I could from it. While I didn’t understand anything about the game itself, it provided for me a structure of types of heroes, types of weapons, types of magic that imprinted upon me. I loved the artwork and the next year at school it dominated the recess games I played with my friends. We were a band of warriors, and the fact that the Dungeons and Dragons cartoon started around this same time only served to fuel the fire. 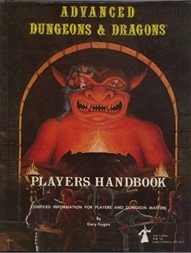 The only problem being that we lived in the bible belt, and “Dungeons and Dragons” was an evil thing. So instead I got wrapped up in the Marvel Super Heroes game also by TSR. For some reason my friends parents could stomach them playing a game based on comic book heroes, so long as we never referred to or referenced it as being “like” D&D. We had to go so far as to hide the dice needed to play it, so as a result I became the game master because my parents were cool with all of this. The next major event in my game development came with the release of the Nintendo Entertainment System. Up until this point I had been doing everything I could to squeeze the joy out of a combination of the Atari and my scattered pen and paper role playing games. Then my cousins came to town with their Super Mario Bros and completely destroyed my world. Everything about the NES was just better. There were stories being told through the games, and with characters that you could actually recognize as characters. I grew up in a pretty small town and the arcade was a less than savory place. So my exposure to Arcade games to that point was pretty much limited to the occasional lobby of a department store. While I craved playing them, and begged my parents for a quarter anytime we were near one… it was not something I really got to do all that often. When the NES came on the scene I was completely blown away by the graphical fidelity and my entire existence became about getting one. 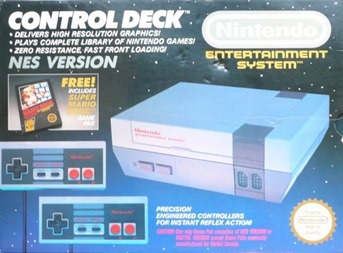 This was the Christmas that the Nintendo was universally sold out around the country. I had to be the most annoying kid because I kept tabs on which stores had them, which stores were rumored to have them… and which stores were sold out. I kept my parents up to date on my findings, in hopes that they would rush out and get one. So as Christmas rushed towards us and there was no Nintendo shaped box under the tree… I was completely devastated. Then Christmas morning happened… and I had put on a good face and was prepared to swallow down the disappointment. There under the tree was sitting a gleaming Control Deck box just like the one above. This was probably the most joy I had experienced to that moment, and if my parents had a video camera it probably would have looked a lot like the N64 kids. This was the single best and worst Christmas I had ever experienced. About two hours after getting my Nintendo… we lost power due to an Ice Storm that was raging… and we did not get power back for three days. So while I had the object of my desire… I had no power with which to actually enjoy it. The rest is pretty much history, games like Final Fantasy were able to merge my love of RPGs and my love of games, and now I spent most of my time playing MMOs. I still think however that people either are inherently game lovers or they are not, and there isn’t really much that can “make” a gamer.